This group played The Cask on the first night of their tour. They were in good humour and keen to perform their repertoire of gypsy jazz to a good-sized audience. 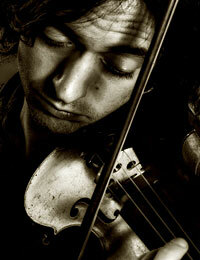 Matt Holborn's playing exploited all that can be got from a violin, eloquence, excitement or melancholy as required. Ben Mullen's lead guitar playing was so dazzling on fast numbers that one expected to see smoke rising from his fingers! Underpinning the virtuoso qualities of those two was the splendid rhythm guitar of Ben Danzig. He provided the irresistible springy rhythms that had everyone's toes tapping. Simon Read's double bass gave a solid foundation over which the others could fly. He also quietly sings what he plays, which is rather charming. Naturally, the repertoire had a few Reinhardt/Grappelli compositions and tunes associated with the Hot Club de Paris. However the band leavened those with some surprises, such as Dizzy Gillespie's minor blues Birk's Works. Scattered throughout the evening were several popular standards, a Matt Holborn original and an old German song which had a beautifully heartfelt solo from Matt. The quartet refreshed their sound in different ways. Lead guitar and violin sparked each other exchanging fours on What Is This Thing Called Love? and Minor Swing. During 'Out Of Nowhere', Simon's nimble bass solo was supported by two rhythm guitars driving powerfully along. Solene had a double tempo passage, and on Joseph Joseph the rhythm stopped to allow violin and lead guitar to interweave excitingly. Nuages was played as a guitar and violin duo, with Matt sometimes plucking the strings of his violin. The band triumphantly achieved that insistent, bouncy swing, typical of the Hot Club recordings and were a pleasure to listen to. Added to that, the passion, lyricism and sheer musical accomplishment of the lead instrumentalists made for a great evening.